How Will You Drive the Ford Mustang Muscle Car? With a rich pedigree dating back to 1962, the Ford Mustang is an iconic sports car. As you'd expect, this muscle car is optimized for rapid acceleration on the track. A classic manual transmission system with six speeds and the Rev Matching function is available in the Ford Mustang. You could also get a 10-speed automatic transmission system that operates on the SelectShift technology. This model wears high-performance brakes with multiple calipers and ventilated discs. Featuring several modes, the electric power-assisted steering system puts you in total control. A rear-wheel drive (RWD) is also standard in this highly dynamic car that's eager to hit the track. 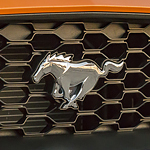 Malloy Ford has the Ford Mustang available for sale in Winchester, VA. Stop at our dealership to explore the awesome handling of this legendary muscle car. Some of the trims that you'll see in our inventory include the EcoBoost Convertible and Bullitt.